RSA is an addon that can announce spell casts to various chat channels. There is a large selection of abilities for each class that RSA can announce, such as interrupts, defensive cooldowns, and utility spells e.g Soulstone. I've setup a Patreon to go toward my WoW subscription so I can keep my addons up to date as I'm not currently playing WoW. If you'd like to throw me a dollar to keep my addons working, check out the link below. Cheers. You can open RSA's configuration window by typing /rsa in chat. You can alternatively go to the addon settings tab in the Interface options, and find RSA in your list of addons, which has a button to open RSA's configuration panel. PvP: Choose whether to enable in Arenas, Battlegrounds, and War Mode (BFA). PvE: Choose whether to enable in manually formed Dungeons, Raids, LFG Dungeons, LFG Raids, or out in the world when War Mode is off. Whispers can be set to ignore the PvP & PvE settings to allow them to always whisper targets. Useful if you always want to let someone know when you're resurrecting them for example. 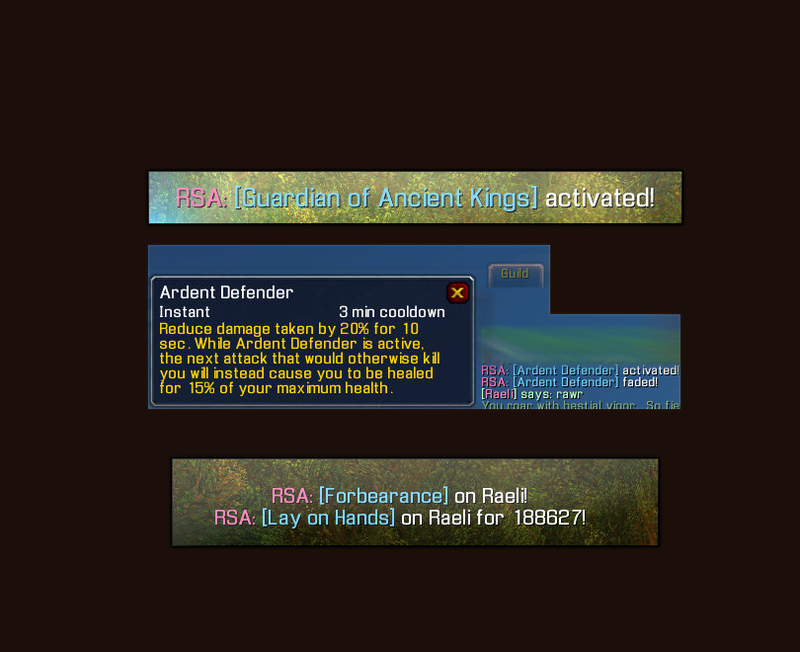 The messages sent by RSA are completely customisable, you can add several messages (as of BFA) for each announcement, and RSA will choose a random one to use each time. You can remove messages by simply clearing the box containing your message and pressing enter, this will remove it from the list of potential messages. If you have no messages for a given spell or section, then it will not announce. You can use the Tags below in your messages to make your messages more informative. Every spell uses the first two tags, other tags are usable only on spells where they would return anything useful. [SPELL] will be replaced with the name of the spell. [LINK] will be replaced by a clickable spell link of the spell cast. [TARGET] will be replaced with the target of the spell. [AMOUNT] will be replaced with the amount of damage or healing done. [MISSTYPE] will be replaced with Immune/Blocked/Resisted etc. [AURA] will be replaced with the buff or debuff removed by dispels. [AURALINK] will be replaced with a clickable spell link of the buff or debuff removed by dispels. [TARCAST] will be replaced by the spell that you have just interrupted. [TARLINK] will be replaced by a clickable spell link of the spell that you have just interrupted. Local - Sends a message locally only visible to you. You can choose which part of your UI this is sent to in the Local Message Output Area in the General Options. Instance - Sends to /instance if you're in an instance group. Raid - Sends to /raid or /instance depending on what is most appropriate. Party -Sends to /party or /instance depending on what is most appropriate. Smart Group Channel - Sends to /instance, /raid, or /party depending on what is most appropriate. Whisper - sends a whisper to the target. Only available if the target has the potential to be someone other than yourself. Custom Channel - You can send it to a custom channel, like, say, your healing channel. You can report issues on Curseforge or contact me directly through my Battle.net community. RSA supports localisation, if you want to help me out by localising RSA, please go to the localisation page on Curseforge.